I love Gold Toe Socks. Have been wearing them for years, and I just received several more pairs. Gold Toe fit my 5 year old, son, perfectly. He doesn’t like high socks, but he loves these socks from Gold Toe. I don’t know why he’s had issues with other brands, but Gold Toe fit him perfectly, and he’s so glad to wear them. They keep his legs warm, which is my favorite part, and they are fashionable. Easily matched, because of the colors, and he just adores them. 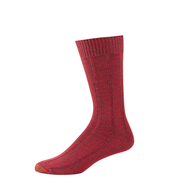 Gold Toe’s kids’ sock collections serve double duty; in addition to looking fashionable, the quality socks also feature the EZ MATCH® sizing system — ideal for households with multiple children. Gold Toe also has great Men’s Socks. My father-in-law loves them. He’s been wearing them for about two weeks, and says every time they are washed, he will put them back on. He said to me, “not only are they stylish, but they are so comfortable.” This is the perfect reason, to pick up these socks, for the man in your life. 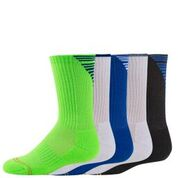 From bright colors and funky prints to more traditional patterns, like your classic argyle, spice up one’s sock drawer with this bold yet fun collection. 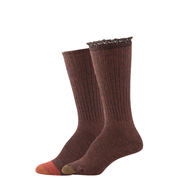 The Woman’s Boot Socks are so stylish, as well. And, they are more than comfortable. Wearing these socks, I don’t even realize I have socks on my feet. I love the little ruffle, at the top. That’s what puts it into style, with todays designs. Whether it’s the chic crochet boot toppers, paisley and peacock floral prints or classic over-the-knee socks, Gold Toe carries a variety of trendy products ideal for revamping one’s fall and winter wardrobe.